My posts contain affiliate links. For more info, read the disclosure page! Does the thought of having to buy Christmas presents leave you stressed? Maybe the budget is tight and you really don’t have much wiggle room but you want to have a special holiday season with your kids, family, and friends? Do you find yourself wondering where the money for Christmas is going to come from? What should be a fun time of year often times isn’t because of the financial burdens and other obligations. We’ve talked before about taking the emphasis off of gifts at Christmas (something I’m all about) but having no money for Christmas is a whole different matter. To help you out I have 10 ways you can come up with some cash for Christmas. Start these things today to help with this season but then continue doing them in January and through the rest of the year and set aside the money you earn into a “money for Christmas and birthdays” fund. 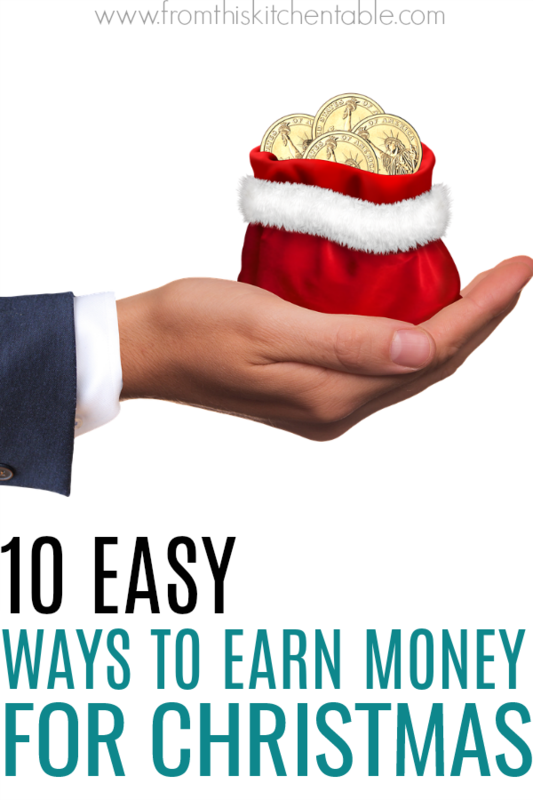 This list mostly consists of money making ideas to help you earn extra money for Christmas, but I’ve thrown in a couple bonus ideas on saving money and stretching your dollar too. I know this one is hard, especially for us moms with little kids. But it is worth looking for a seasonal job you can work around your husband’s hours. Find a weekend or evening job at a retailer hiring extra help the next few months. Watch the classifieds, ask around, and also pay attention in Facebook groups for tips on these seasonal jobs. Have date night babysitting you offer monthly. Plan a babysitting night so parents can go out and buy presents and shop for holiday events without having to take the kids along. Adult only Christmas parties mean still another need for babysitters. I can’t be the only one that is horrible at wrapping presents and gets absolutely no enjoyment out of it. But I know that some of you love it. Sell your gift wrapping skills – there will be people out there excited to pay someone (you) to do it for them! I enjoy baking and cooking. Some people don’t. If you are skilled at baking bread, Christmas cookies, dinner rolls or fudge, considering selling your goodies. Many busy families and people that really don’t enjoy spending time in the kitchen would prefer to buy homemade treats instead of purchasing grocery store items. Please research Cottage Food Laws for your state before you get started. Rules and regulations greatly vary. You will also need to register with your state to file sales tax. Get your kids involved and, depending on how early in the season it is, rake leaves or shovel snow. Print up flyers and hand them out around your neighborhood and town. Post on Facebook groups. Even if you do this for just one snow storm you can earn a chunk towards your Christmas expenses. November and December are busy months. Individuals and businesses are both hosting parties. If you are a skilled organizer and hard worker, market your services as either an event planner, event host, or an event assistant. I dare say the majority of us have too many things. What do you have that’s quality and something that others will want? Considering selling on Ebay, Facebook groups, decluttr.com, or even having a garage sale. This is a quick way to earn money for Christmas. You will also be organizing and decluttering items you don’t use before more stuff arrives from the holidays. I’ve never done this but I have a sister that has sold plasma to save money for presents and other splurge items she wanted. You can donate twice a week. 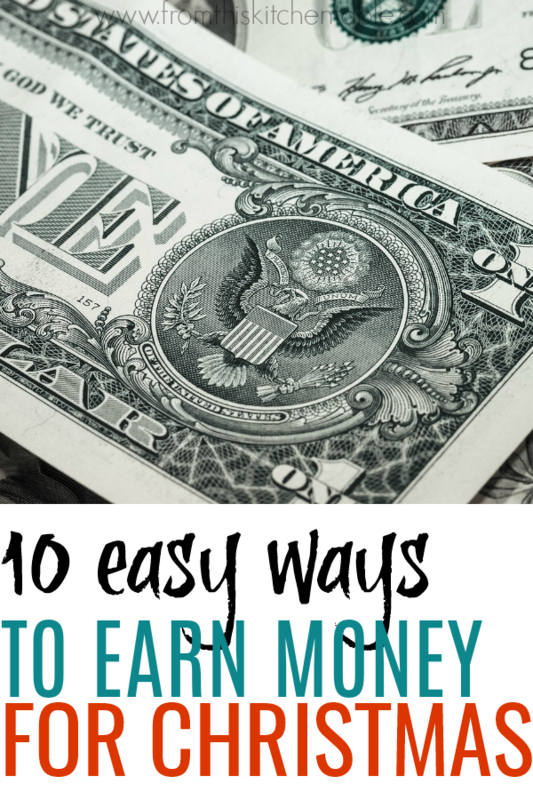 One of the best ways to “earn” money is to find ways to spend less and rework your budget! I’d say it’s one of the easiest ways as well – because it doesn’t involve finding extra hours each week to work. Make a menu plan and spend less on groceries, say no to coffee, drink water, have a no spend challenge. Here are some ideas on ways to save even on a tight budget! I don’t want you to stress about finances this Christmas. Instead, sit down and plan on spending less on presents this year. Maybe have a simpler meal, and participate on fewer costly holiday events. 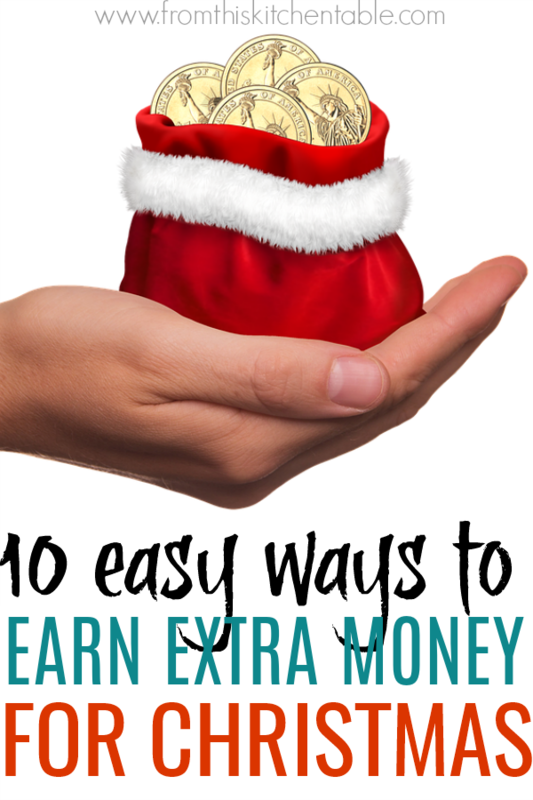 Then, use a few of these ways to earn money for Christmas and earn some extra cash to use to purchase the presents and attend the events that you decide to do! Enjoy a debt free Christmas this year! 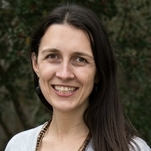 This entry was posted in Christmas, Holidays on November 7, 2018 by Deanna Michaels.